Rand McNally Historical Atlas of the World. This collection of seventy-five full-color maps spans over 5,000 years of world history, from preliterate times to the present. Emphasizing the dynamic nature of cultural change and interaction, it highlights such themes as the diffusion of languages and religions, as well as the rise and fall of entire civilizations. 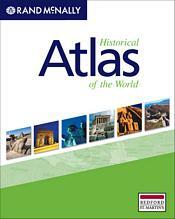 For only $5, you can add this atlas to any Bedford/St. Martin’s text: Ways of the World (Strayer) and A History of World Societies (McKay et. al.). For package ISBNs and prices, please contact your Bedford/St. Martin’s sales representative.